I am new to X theme but I just converted over to Pro. before I learned x theme. I need to make a simple parallax one page website. A logo, about, services & contact with map as well as social media links and facebook box... All in one page with a menu that scrolls to each section within the page. I AM LOST. I have no idea how to do this with x pro. I believe you could start by adding a template to the header builder of pro. From there, you could not insert menu and other stuff that you want to add to your header. After that, you need to know how to create a one page navigation so that you could move your menu into a section. Lastly, you need to create content. 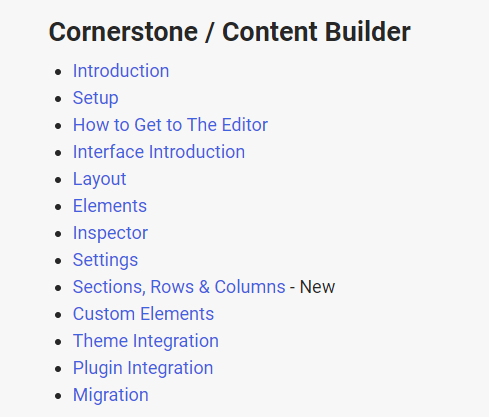 Check the link below for more details on how to use cornerstone or our content builder. cornerstone is part of pro? In PRO we call it Content Builder but it works the same as Cornerstone. not to be difficult or anything but it not helping because I am a beginner So do I have to install content builder in pro? I am working in pro and I am really lost. Let me try to clear your some of your confusion. X Theme and Cornerstone: In X Theme to design a page you need to use Cornerstone page builder tool. Although when you install X Theme, Cornerstone get automatically installed but it's a plugin. And similar to any WordPress plugins, you can perform all the basic functions like, update, activate, deactivate, delete. Pro Theme: In Pro Theme Cornerstone is inbuilt into the framework (when using Pro Theme we call it content builder). You don't have to install anything. Just install Pro Theme and in click Edit with Pro button in pages/post.